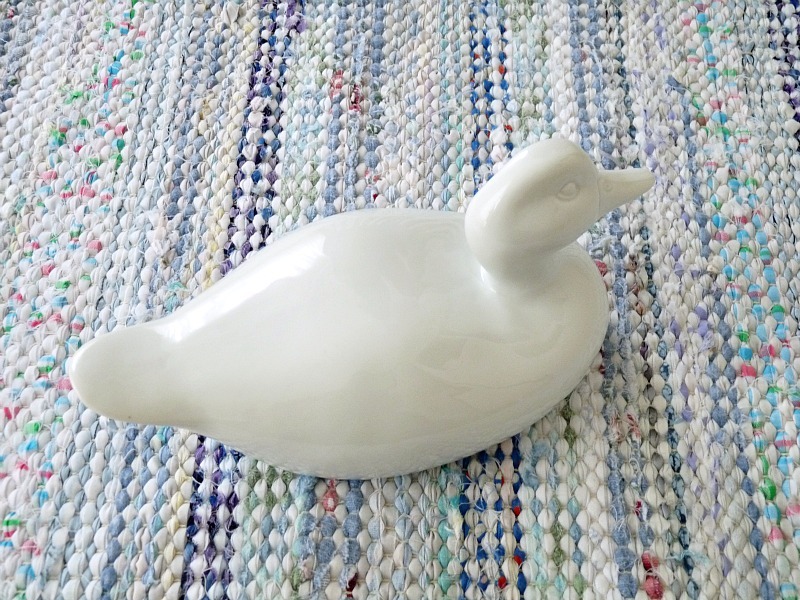 After a quick detour to chat about my research, it’s back to business: cute home stuff! Gosh, am I ever tickled pink by my recent treasure hunting report (see others by searching “treasure hunting report” in the google search bar, to the right). Even a miserably rainy Saturday couldn’t dampen my smile. Okay, maybe literally. Hubs and I got soaked yard saling! But I was still beaming. We always have fun together, rain or shine. 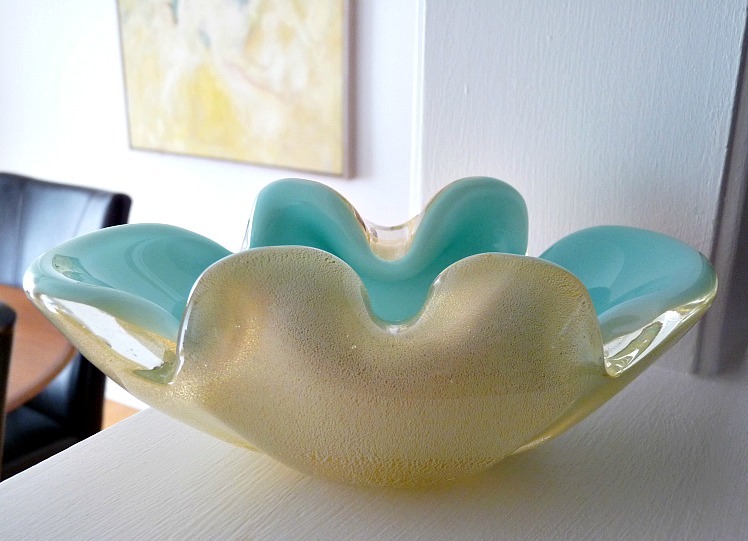 The most stunning glass dish, in my favorite colour! It looks amazing in the living room (you’ll see its new home soon). It picks up the colours in the art and just glows, like it’s made of sunlit ginger ale. At $6.99, it was a steal. And I’m not even going to try to pretend it isn’t an ashtray. I like Duck Butts and I Cannot Lie. 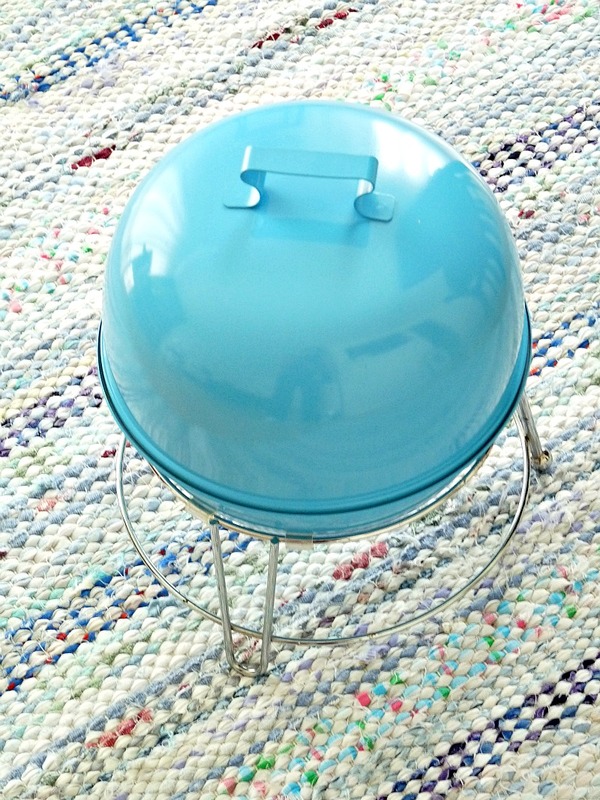 I also found this adorable vintage style BBQ. 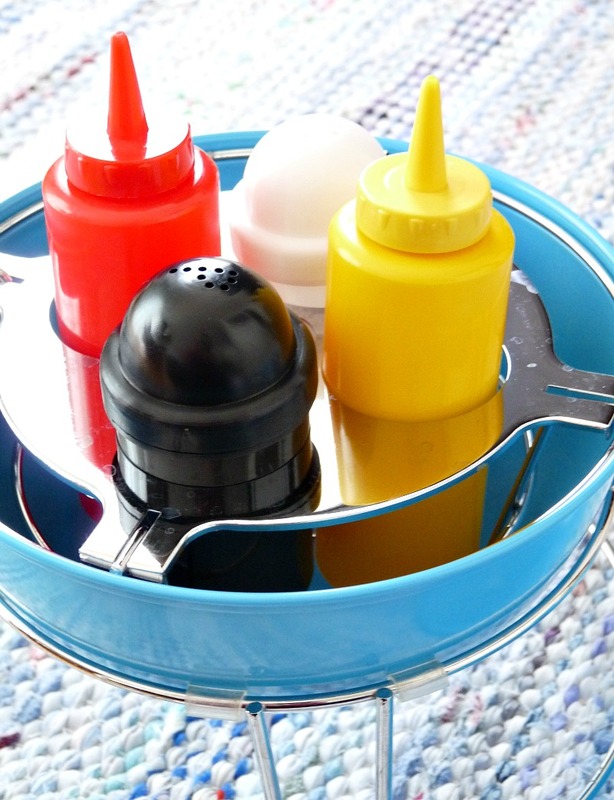 But guess what it is . . .
. . . a condiment caddy! It is too cute for words (plus it’s, everyone together this time, turquoise!) I have NO room for this but it was so adorable, I had to buy it. I might pass it on to someone else or maybe Camilla needs a play BBQ to go with her play kitchen? Right now I eat my breakfast staring at it. Anyone else score sweet deals treasuring hunting this past weekend? No? Want something cute for free? Great finds!! 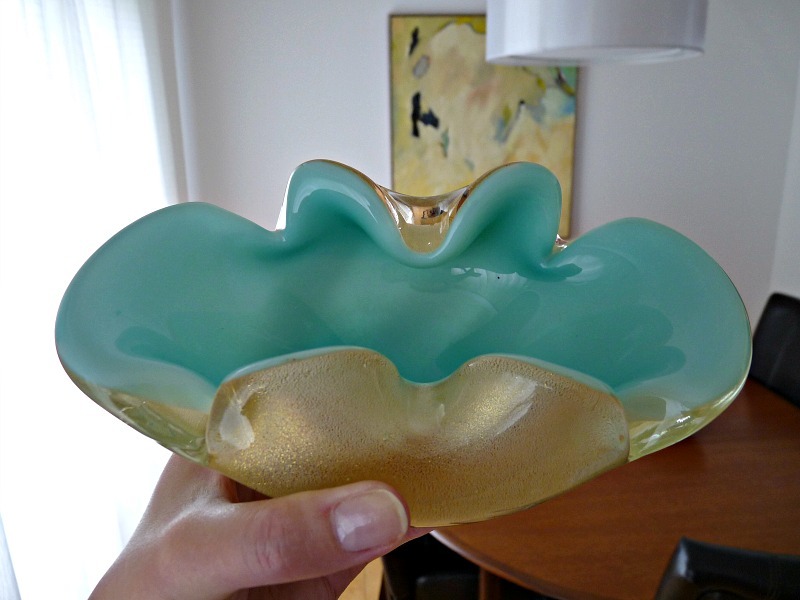 That glass dish looks like it came from a high end boutique! Never would have guessed it was such a steal. Lucky you! I think it would have been pricey at an antique shop, so I really lucked out! Great finds! I should start attending these rummage sales as well! Definitely! Sometimes my Hubby (and partner in thrifting) works Saturdays, so maybe one day we can go together! The BBQ is so cute! It'd be great to go along with the play kitchen! That turquoise bowl is amazing! And your right, it looks just like ginger ale. You find the best stuff! Ah I love that bbq! How adorable!! Yes! Move back and we'll thrift together ;)I think the trick is to go early early to catch good stuff or late in the day to find a bargain. And I do this every weekend, so my odds improve! You were in my hood!! I was bummed that a lot of the sales were rained out. 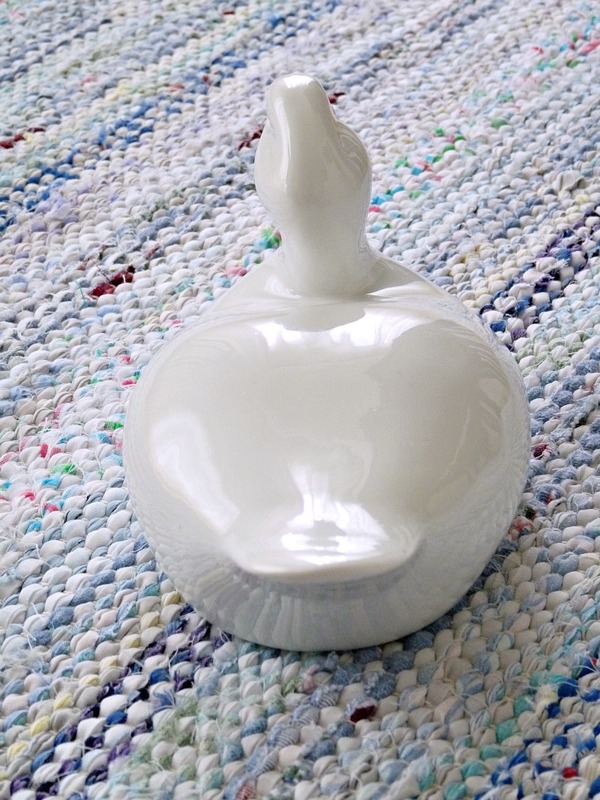 DYING over that condiment caddy… SOOO cute. I WAS in your neck of the woods on my yard sale route. I don't often wander into Westboro on a Saturday, but this time St. Vin's delivered! What a fun list of scores! Color me turquoise, I'm envious of that duck! 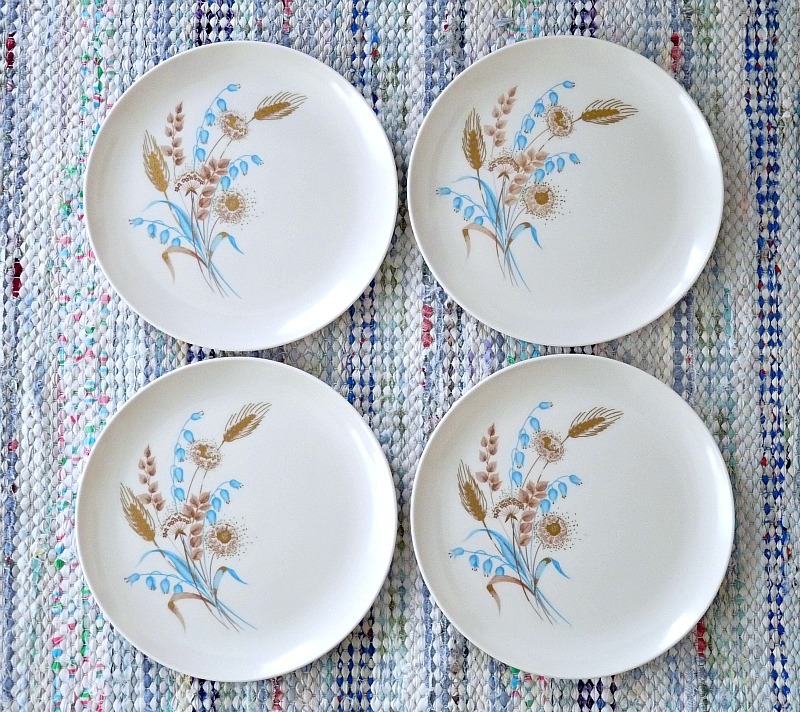 Oh my gosh, the malamine plates bring back memories! This is what we used to picnic with when I was a kid! I'm loving all the treasures you're finding and sharing with us. Your Etsy store is going to be a treasure chest!!! Except I won't be able to part with anything – I only buy stuff I love!! I might not be cut out for this, lol. Love all of the great finds. Turquoise is my favorite color. Glad to hear it! Such a cheery colour, isn't is? 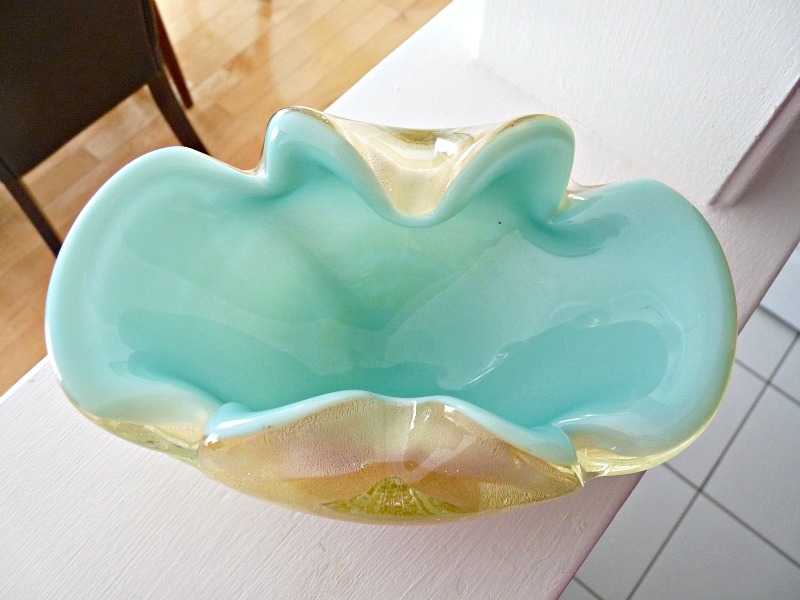 I love the ashtray/bowl, and the condiment tray is adorable. OMG I love the bowl! My aunt was JUST talking about St. Vincent's the other night and how she sometimes finds treasures there. Now I have to go! 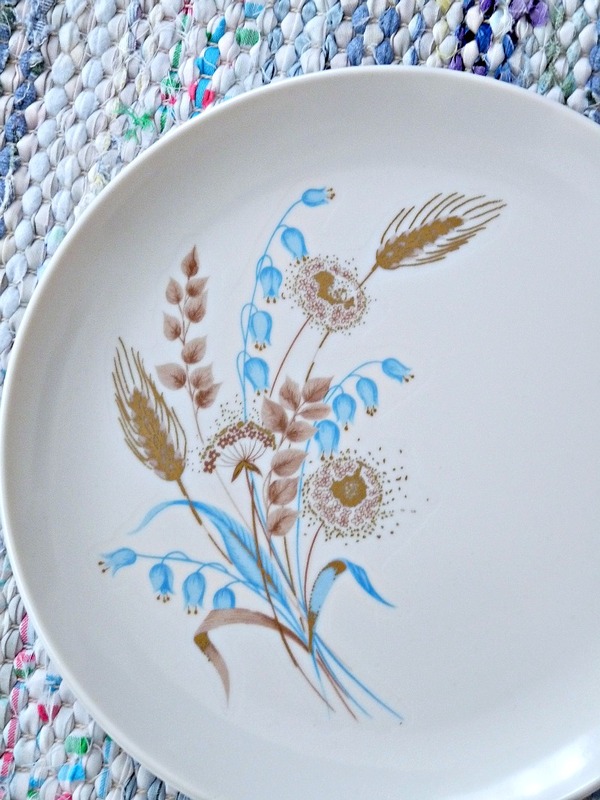 if youre crazy about malamite turquoise dinnerware, I have a whole bunch I just found in Moms garage..